Joan of Arc is a 1948 American hagiographic epic film directed by Victor Fleming, and starring Ingrid Bergman as the French religious icon and war heroine. It was produced by Walter Wanger. It is based on Maxwell Anderson's successful Broadway play Joan of Lorraine, which also starred Bergman, and was adapted for the screen by Anderson himself, in collaboration with Andrew Solt. It is the only film of an Anderson play for which the author himself wrote the film script (at least partially). Unlike the play Joan of Lorraine, which is a drama that shows how the story of Joan affects a group of actors who are performing it, the film is a straightforward recounting of the life of the French heroine. It begins with an obviously painted shot of the inside of a basilica with a shaft of light, possibly descending from heaven, shining down from the ceiling, and a solemn off-screen voice pronouncing the canonization of the Maid of Orleans. Then, the opening page of what appears to be a church manuscript recounting Joan's life in Latin is shown on the screen, while some uncredited voiceover narration by actor Shepperd Strudwick sets up the tale. The actual story of Joan then begins, from the time she becomes convinced that she has been divinely called to save France to her being burnt at the stake at the hands of the English and the Burgundians. Joan of Arc was made in 1947–1948 by an independent company, Sierra Pictures, created especially for this production, and not to be confused with the production company with the same name that made mostly silent films. Filming began 16 September 1947 and was done primarily at Hal Roach Studios, with location scenes shot in the Los Angeles area. The 1948 Sierra Pictures never produced another film after Joan of Arc. Bergman had been lobbying to play Joan for many years, and this film was considered a dream project for her. It received mixed reviews and lower-than-expected box office, though it clearly was not a "financial disaster" as is often claimed. Donald Spoto, in a biography of Ingrid Bergman, even claims that "the critics' denunciations notwithstanding, the film earned back its investment with a sturdy profit". The movie is considered by some to mark the start of a low period in the actress's career that would last until she made Anastasia in 1956. In April 1949, five months after the release of the film, and before it had gone out on general release, the revelation of Bergman's extramarital relationship with Italian director Roberto Rossellini brought her American screen career to a temporary halt. The nearly two-and-a-half-hour film was subsequently drastically edited for its general release, and was not restored to its original length for nearly fifty years. Bergman and co-star José Ferrer (making his first film appearance and playing the Dauphin) received Academy Award nominations for their performances. The film was director Victor Fleming's last project—he died only two months after its release. In Michael Sragow's 2008 biography of the director, he claims that Fleming, who was, according to Sragrow, romantically involved with Ingrid Bergman at the time, was deeply unhappy with the finished product, and even wept upon seeing it for the first time. Sragrow speculates that the disappointment of the failed relationship and the failure of the film may have led to Fleming's fatal heart attack, but there is no real evidence to support this. While contemporary critics may have agreed with Fleming's assessment of Joan of Arc, more recent reviewers of the restored complete version on DVD have not. The movie was first released in November 1948 by RKO. When the film was shortened for its general release in 1950, 45 minutes being cut out; it was distributed, not by RKO, but by a company called Balboa Film Distributors, the same company which re-released Alfred Hitchcock's Under Capricorn, also starring Ingrid Bergman. The movie was first released in November 1948 by RKO. When the film was shortened for its general release in September 1950, it was distributed not by RKO, but by a company called Balboa Film Distributors, the same company which re-released Alfred Hitchcock's Under Capricorn, also starring Ingrid Bergman. The complete 145 minute version of Joan of Arc remained unseen in the U.S. for about forty-nine years. Although the complete Technicolor negatives remained in storage in Hollywood, the original soundtrack was thought to be lost. The movie was restored in 1998 after an uncut print in mint condition was found in Europe, containing the only known copy of the complete soundtrack. When it finally appeared on DVD, the restored complete version was hailed by online movie critics as being much superior to the edited version. It was released on DVD in 2004. The edited version received its first television showing on CBS on the evening of April 12, 1968 (an Easter weekend), and has been shown on Ted Turner's WTCG and on cable several times. Although the complete, unedited version of the film was scheduled to be shown on American television for the first time on February 13, 2011, by Turner Classic Movies, with a broadcast window of 2-1/2 hours, it was pulled and the 100 minute edited version was presented later, on Sunday, February 27. However, the full-length version was finally shown on Turner Classic Movies on March 13, 2011. This marked the first time that the complete unedited version had ever been shown on American television. It has now been shown several times by TCM and appears to have supplanted the edited version. There are several differences between the full-length roadshow version of the film and the edited general release version. One that is immediately noticeable is that there is actually a snippet from Joan's trial during the opening narration in the edited version, whereas in the full-length version, the events of Joan's life are shown in chronological order. The narration is more detailed in the edited version than in the complete version, with much of it used to cover the breaks in continuity caused by the severe editing. The edited version omits crucial scenes that are important to a psychological understanding of the narrative, such as the mention of a dream that Joan's father has which foretells of Joan's campaign against the English. When Joan hears of the dream, she becomes convinced that she has been divinely ordered to drive the English out of France. Most of the first ten minutes of the film, a section showing Joan praying in the Domrémy shrine, followed by a family dinner and conversation which leads to the mention of the dream, are not in the edited version. In the complete 145-minute version, the narration is heard only at the beginning of the film, and there are no sudden breaks in continuity. Entire characters, such as Joan's father (played by Robert Barrat) and Father Pasquerel (played by Hurd Hatfield) are partially or totally omitted from the edited version. Even the opening credits are somewhat different, and run about two minutes longer. In the edited version, the story begins after Victor Fleming's director's credit, while in the full-length version, after the director's credit, a title card saying "The Players" appears onscreen, after which all the major lead and supporting actors, as well as the characters that they play, are listed in order of appearance and in groups (e.g., "At Domrémy", "At Chinon", etc. ), much as in Fleming's other lengthy film epic Gone with the Wind. More than thirty of the actors are listed. The edited version might be considered more cinematic through its use of maps and voice-over narration to explain the political situation in France. (In the full-length version, Joan's family discusses the political situation during dinner.) The full-length version, although not presented as a play-within-a-play, as the stage version was, nevertheless resembles a stage-to-film adaptation, makes great use of Maxwell Anderson's original dialogue, and may seem, to some, stagy in its method of presentation, despite having a realistic depiction of the Siege of Orléans. One of the modern criticisms of the film is that Bergman, who was 33 at the time she made the movie, was nearly twice as old as the real Joan of Arc; the Swedish actress would later play her (at age 39) in a 1954 Italian film, Giovanna d'Arco al rogo (Joan at the Stake). However, reviewers in 1948 did not object to this; it was — and still is — common in for an older actress to play a teenager, as the twenty-four-year-old Jennifer Jones had in 1943's The Song of Bernadette, for which she won a Best Actress Oscar. Children were also sometimes played by older actors at the time; the sixteen-year-old Judy Garland had played twelve-year-old Dorothy Gale in the 1939 film classic The Wizard of Oz, another film directed by Victor Fleming, and the nineteen-year-old Charlotte Henry had played Alice in Alice in Wonderland (1933). Several contemporary critics criticized the film for being slow-paced and dialogue-driven, as does contemporary critic Leonard Maltin, who has not yet reviewed the full-length version; he has said that there is "not enough spectacle to balance the talky sequences". The film was one of the biggest hits of the year earning $4.1 million in the US. However, due to high cost it recorded a loss of $2,480,436. ^ a b "Joan of Arc: Detail View". American Film Institute. Retrieved May 1, 2015. ^ Variety (27 March 2018). "Variety (February 1948)". New York, NY: Variety Publishing Company – via Internet Archive. ^ Spoto, Donald (26 April 2001). "Notorious: The Life Of Ingrid Bergman". Da Capo Press – via Google Books. ^ Higham, Charles; Greenberg, Joel (1968). Hollywood in the Forties. London: A. Zwemmer Limited. p. 112. ISBN 0-302-00477-7. ^ Sragow, Michael (9 December 2008). "Victor Fleming: An American Movie Master". Pantheon – via Amazon. ^ "dOc DVD Review: Joan of Arc (1948)". www.digitallyobsessed.com. ^ "The DVD Journal - Quick Reviews: Joan of Arc". www.dvdjournal.com. ^ "Joan of Arc". DVD Talk. ^ Crowther, Bosley (November 12, 1948). 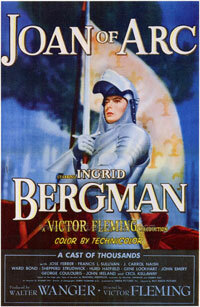 "Ingrid Bergman Plays Title Role in 'Joan of Arc' at Victoria -Two Other Films Arrive". The New York Times. ^ "Cinema: The New Pictures, Nov. 15, 1948". 15 November 1948 – via www.time.com. ^ Maltin, Leonard (5 August 2008). "Leonard Maltin's 2009 Movie Guide". Signet – via Amazon. ^ "NY Times: Joan of Arc". NY Times. Retrieved 2008-12-20. ^ "Magazine Enterprises: Joan of Arc". Grand Comics Database. Wikimedia Commons has media related to Joan of Arc (1948 film).